Science Creative builds a new branding program for the next generation of global business networking software. The new face of social networking for global business was recently unveiled in Beijing, China. Science Creative was contracted by a technology development company based in Bangalore, India, the Silicon Valley of India, to create an integrated branding program to support the global launch of the company’s new business-networking platform at the World Trade Center’s General Congress in Beijing, China. The WTC Association represents over 1 million international trading organizations in 326 cities in 92 countries. Like the world’s leading social networks that connect communities of mutual interest, this business-networking platform has the potential to instantly unite the global community of commerce and trade organizations by enabling members in every World Trade Center to transact goods and services and to share business intelligence in real time. The platform is a veritable Facebook for business on steroids. Creating A New Branding Program At The Speed Of International Business. A robust online network that has the potential to coalesce the world of business in one interconnected, thriving and growing community of economic opportunity deserves a big and powerful name. Creative genesis of the new name was fast-tracked, condensing best practice methodology into an accelerated process. Numerous name options were developed based on potential dimensions including descriptive, historical, suggestive, metaphysical and neological paths. The final name evokes an image of global prosperity, bold attitude and an audacious spirit. The new brand strategy positions Immencity as the nucleus of economic opportunity, a virtual hub that unites international businesses in the common pursuit of economic development, growth and prosperity. Following are the highlights of the new brand strategy. 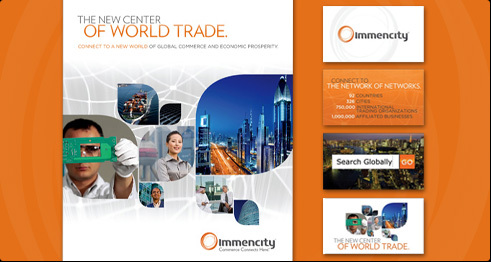 Brand Vision - Immencity is the catalyst for global business opportunity and prosperity. 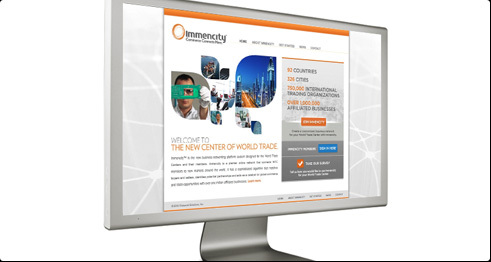 Brand Differentiation - Immencity is the only social networking platform that uncovers new global commerce, trade and business opportunities for international businesses seeking to connect with a worldwide community of economic prosperity. 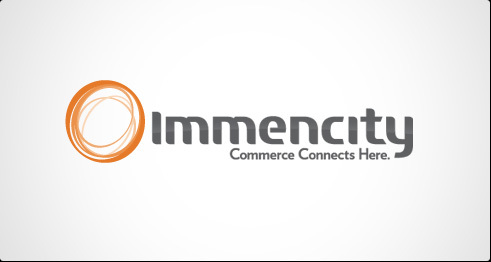 Brand Promise - Immencity connects global business intelligence with worldwide market opportunity. Brand Personality - Innovative, human, modern, community-oriented, knowledgeable, dynamic, honest and accessible. The logo design is an evocative icon of openness, innovation, community and global movement that connects the brand with World Trade Center business people. The tagline establishes the simple truth of the brand’s promise. Developing a new brand is challenging enough; ensuring that the brand is expressed consistently across all touch-points adds another layer of complexity altogether. To help the company manage its brand on an ongoing basis, we created basic graphic guidelines to ensure brand consistently across the many channels of communications. Working efficiently, we developed an architecture and platform of content, imagery and key messaging for the core marketing materials. Progressive companies recognize that video is an exceptionally effective communications tool to deliver an engaging and persuasive message. For the launch of Immencity, we created a short video to communicate the reasons why this network is well suited for the World Trade Center community. The brand’s website is a critical asset in the awareness building and membership recruitment efforts of the new network. We designed a simple, easy-to-navigate website that showcases the features and benefits of the new network and is a portal for membership recruitment, registration and access to the Immencity platform.